Discussion in 'Google TV News' started by dgstorm, Jun 26, 2012. IRVINE, Calif., June 26, 2012 /PRNewswire/ - VIZIO, America's #1 LCD HDTV Company*, announced today the launch of the highly anticipated VIZIO Co-Star™ Stream Player. Using the latest version of Google TV™, the VIZIO Co-Star makes it easy to transform any HDTV into the ultimate smart TV, merging live and streaming entertainment into one intuitive and easy experience. With VIZIO's new stream player, users get instant access to thousands of apps, full-screen web browsing capabilities-via Google Chrome™ with Adobe® Flash® Player and HTML 5 support-and the best in streaming entertainment. Unique to the stream player market, the VIZIO Co-Star offers the distinct advantage of connecting to a cable or satellite box. This allows viewers to enjoy live TV along with the web, apps, OnLive cloud gaming, and other streaming entertainment without interrupting what they're already watching. This integrated experience along with the universal touchpad remote with keyboard eliminates the need to switch TV inputs or remotes to access alternative content and provides viewers with a truly smart TV experience. "Our focus to deliver the best consumer experience continues with today's announcement of the Co-Star, which delivers a superior smart TV interface that anyone can add to their existing HDTV," said Matt McRae, VIZIO's Chief Technology Officer. "We combined the powerful features of Google TV™ with an intuitive and easy to use interface, giving users the power to enjoy an entire world of entertainment." The added benefit of Google TV's powerful search feature lets viewers easily browse websites, hunt for streaming movies or locate their favorite TV shows; and with picture-in-picture technology, it can all be done while simultaneously watching live TV action. In addition to favorite apps such as Netflix®, Amazon Instant Video, M-GO, YouTube® and iHeartRadio, the VIZIO Co-Star is the first stream player to offer video games on demand through the OnLive® Game Service. OnLive allows users to demo, watch and play hundreds of top-tier video games directly from 'the cloud' via their VIZIO Co-Star, eliminating the need for users to own an independent game console. With easy access to thousands of apps through Google Play, Co-Star offers the most comprehensive stream player available today. *IHS iSuppli Corporation Research Q2 2012 Market Tracker Report of Q1 2012. **High-speed/broadband Internet service and access equipment are required and not provided by VIZIO. Additional fees and/or subscriptions may be required for certain content and services. VIZIO makes no warranties, representations, or assurances of any kind as to the content, availability, or functionality of third party content or services. Good price, esp if it comes with the game controller. Anyone plans to get this? I hope the interface is cleaner than the revue as its kinda buggy and slow. Anyone knows the hardware specs of the box? I don't think it is correct to say Vizio is reentering the Google TV market since they never left as a result of never being in the Google TV market in the first place until this product. For $100 if the processor is up to the task, it is a killer deal in my opinion. Hopefully it will use the Marvell Armada 1500 Dual Core ARM SoC but I haven't seen confirmation of that yet. I see no way the game controller can be included at that price, most likely a $50 option. How much more powerful is that chip when compared to the one in the revue? How much more ram? Can it support ICS? Different architecture, different approach to task handling, I am not technical enough to know how the Intel Atom CE4100 compares to the Marvell Armada 1500 ARM. Hopefully somebody else with technical expertise can explain why the ARM chip is to be preferred, all I can say is I believe it should be. Eferz, where are you when we need you? I haven't seen RAM specification yet. I believe either chip is capable of ICS and hopefully the first generation boxes get that update as well although when it comes to the Revue, I would say that is unlikely, I would only consider the Sony Google TV devices as likely to be updated to Android 4.0. "Integrated USB port connects to hard drives, keyboards and other peripherals. " I don't own a computer so I probably do more typing than many GTV users. I'm not sure if I'll like typing on the tiny keys with the new remote. I understand it's supposed to be done with thumbs? But I don't own a smart phone either so I've never really tried the whole thumb typing thing. Frankly I was perfectly happy with the Revue keyboard. So it's nice to see it mentioned that the USB port on the new Vizio box will support keyboards. But I'm wondering if Vizio plans on making an optional keyboard available? Wouldn't an ordinary keyboard lack certain GTV functionality - as the GTV controller has certain command keys? I don't own a smart phone but I do own the previous Sony Google TV and I will say I love the Logitech fullsize keyboard in comparison to the tiny thumb qwerty keyboards. At the Vizio website ( vizio.com ) you can learn more about costar. I noticed that on the company website it 's clear that only the keypad (2 sided) and settop box are included. No seperate controller for games in that $100 package. I'm not a gamer but I'm pretty sure that the included keypad will not give the complete experience that gamers are looking for so be prepared to spend some addtional funds for that functionality. 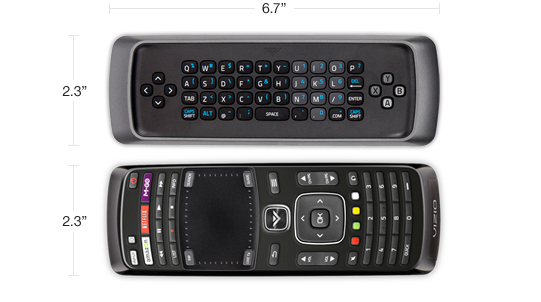 Here's the image of the 2 sided remote.